The healthcare provider ecosystem is evolving to deliver end-to-end, integrated patient experiences. Healthcare in the U.S. is in the midst of a renaissance. The industry is finally catching up to others in terms of consumerism and convenience. Patients are taking more ownership of their health decisions, and the patient experience is becoming more of a priority for the industry. Healthcare has a variety of constituents—insurance companies, wellness companies, labs, pharmacy benefit managers, physicians, hospitals, employers, parents, children, families, churches, etc. The list goes on. At the end of the day, we are left trying to answer the question, “Who cares about my health?” Ironically, the most logical answer seems to have been the last to organize around the consumer—the health system itself. But that is changing. A number of consumer-focused trends have emerged in the healthcare space, particularly for providers. First, patients are looking for unbiased information in their health decisions, particularly when choosing a physician. With more choice, they are turning to places like Yelp, online reviews, social media, and Medicare STAR ratings for objective reviews. At the same time, new regulations, consolidation, and cost considerations are forcing health systems to increase physician productivity and contain costs. Mergers and acquisitions are commonplace, and there is consolidation across the industry. In the midst of these shifts, preventative care and outcomes are beginning to outweigh performance or fee-for-service focus among health systems. Providers receive varied reimbursement amounts that are dependent on patient outcomes, elevating revenue cycle management into a key strategic issue. And finally, technology is fueling innovative collaboration. Amazon, Google, Apple, and Microsoft are all getting in the healthcare game with AI, drug delivery, digital health monitors, and more. Other non-medical companies are partnering with healthcare firms to launch new initiatives with the goal of reimagining how the healthcare system works. The ecosystem is expanding, making traditional operations obsolete. To truly maximize patient outcomes, health systems need to shift their focus to understanding the end-to-end patient journey. This breaks the pieces of the industry out of their silos to integrate and collaborate across providers, hospitals, pharma, payers, and others. 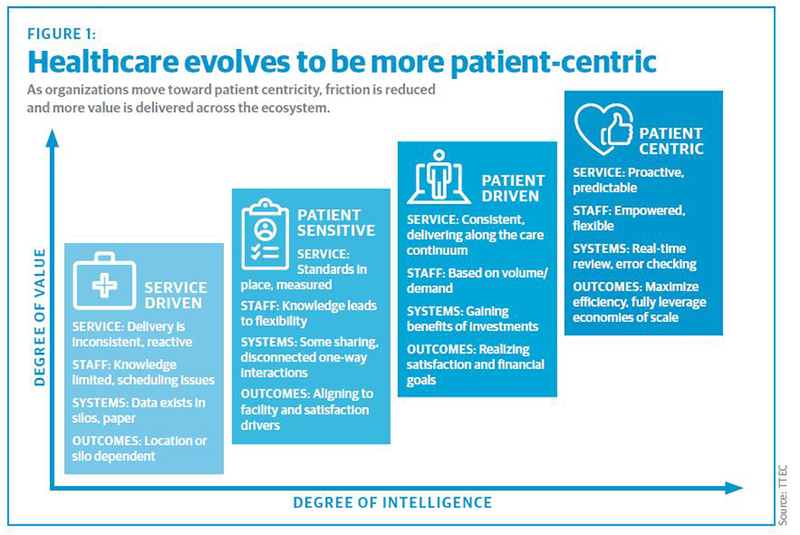 Organizations are driving more value by moving up from service-driven entities to patient-sensitive, patient-driven, and finally, patient-centric ones (see Figure 1). Patient-centric organizations are proactive and predictive, with empowered employees who are nimble and can customize patient interactions for unique situations. They operate with real-time intelligence and information to meet immediate needs and eliminate friction in the patient experience. And internally, they leverage economies of scale and efficient processes in a streamlined manner. The end-to-end patient journey starts before a patient even knows he or she becomes a patient. Individual data starts to create a persona and likelihood for potential intervention, depending on a person’s health needs. Providers can engage consumers with specific campaigns that are relevant based on their health and tailored to personsa. This insight moves with patients as they are treated and through post-discharge. A patient-centric organization follows the patient through the many channels and departments along the way, offering digital and human-based interactions that become more proactive and predictive over time. When a patient calls or goes online to make an appointment, inbound and outbound patient care centers can offer a one-stop shop for prospective and existing patient inquires, appointment setup, and technical assistance, for example. The information is passed down the value chain, where proactive reminders and education resources reach out to patients prior to procedures to remind them of appointments, along with what to expect, where to go, and what to do or not do. If patients are admitted, a central command center consolidates patient, physician, pharma, and treatment information to streamline the admissions, bed placement, and care process. Information is shared in real time among different departments for a single view of patients while they are in the system. In-patient care coordination ensures that barriers to timely patient discharge are identified early and closed by establishing multi-disciplinary care rounding. When it’s time to leave the hospital, discharge resources are deployed to communicate with patients prior to discharge to provide clarification and ensure they are following instructions once they are home. If transitional care to a nursing home or other facility is necessary, the team will continue to manage patient movement from the hospital to the facility that works for each patient. And finally, the organization can maintain patient engagement through a collaborative platform to drive communication on an ongoing basis, serving as a partner in the patient’s health. For those with chronic conditions, providers can set a cadence for follow-up and assist in appointment scheduling and the provision of wellness resources. Following patients through their end-to-end journey requires a combination of culture, technology, process, and human expertise. The complete omnichannel ecosystem involves multiple players. It’s a difficult undertaking, but far from impossible. We have worked with a number of health systems and organizations to enable elements of the end-to-end patient journey. An award-winning non-profit hospital wanted to create a seamless, single point of contact for both patients and physicians via its 1-800 number. We partnered with the hospital system to hire and train highly skilled customer service associates to answer its 1-800 number, focusing on five call types: general information, referrals to hospital departments based on patient symptoms, physician referrals, appointment setting, and insurance questions. They attended an intensive eight-week training period that taught both functional and soft skills through a mix of classroom learning and simulated interactions through role playing. New tools and processes also enabled a more frictionless experience. Individual insurance information was integrated into the system for associates to access more easily, and pop-up windows warned associates of potential compliance errors. New customer-focused features included a geolocator to find the closest physician to a client, and thorough emergency protocols to handle highly emotional instances. The knowledgebase also expanded from a weekly updated Excel spreadsheet to an application that provided associates with live updates from clients. As a result, more physicians signed on to use the team to schedule appointments. And in surveys, patients have remarked that associates acted with effectiveness, timeliness, and empathy with care. California’s Community Regional Medical Center (Community) can be denied reimbursement for care if patients are incorrectly admitted or stay longer than the average length of stay (LOS) required for treatment. It needed to improve patient flow to quickly triage patients within the emergency department and direct them to the appropriate level of care and manage their time spent in the hospital. It developed a command center concept to optimize the interface between humans and technology to build a better model of care delivery and improve bed utilization. The command center combined disparate data into one system and created a structured process for communication. It standardized criteria to determine in-patient status, give staff access to patient documentation in real time, and support effective communication during daily cross-functional “huddles.” Existing roles and functions within the organization were redesigned and repurposed as well. Community improved reimbursement for Medicare patients by $6 million. It also reduced average patient observation stay from 36 hours to 22 hours, and increased the number of bed days by more than 1,400. Welcome Home Health works with healthcare facilities to provide discharged patients with dedicated tablets to enable one-touch daily video calls and 24/7 availability with supportive “health advocates” who follow up about patients’ well-being. Many patients experience anxiety as they move to their next health recovery stage, and knowing there is someone looking out for them can make a world of a difference. Face-to-face video conversations allow the health advocate to be a constant bridge of support to patients, providing daily checkups to ensure they follow discharge orders and are keeping themselves healthy. Health advocates schedule daily meetings with patients to go over their care plan, help them schedule medical appointments, and make sure that they are sticking to their healthcare plan. The approach reduces readmissions and medication errors, and plays a role in helping patients heal at a higher rate than they would without a support system. In some cases, patients who would’ve been released from a rehab hospital to a nursing facility instead were able to go home, with oversight from health advocates. While the idea of a patient-centric, end-to-end experience seems overwhelming, it can be done. There are a few key attributes to put in place to enable such an evolution of the provider system. A mix of operational, cultural, and technological factors must work together. The good news is that it’s never been easier. Technology advances every day, and best practices from leaders like Amazon and Google are beginning to show what’s possible. First, take stock of your current operations. Understand the current system and map the patient and functional experience across departments. Rather than reinventing the wheel, pick a specific condition or service line to pilot, such as orthopedics, which is somewhat contained and has revenue and operational upsides. Then, bring all parties together—clinicians, back-office, administrators, IT, and other areas of the service line who will be involved. Encourage a patient-focused culture when they work together to overcome internal challenges and meet patient needs. Share data as allowed to gather a more complete picture of each individual patient. 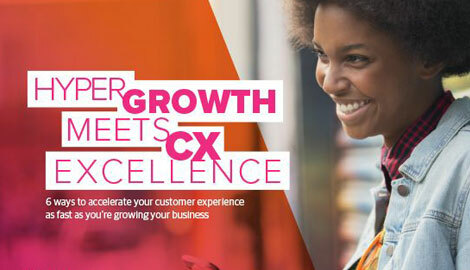 With a team in place, use a cross-functional center of excellence model, where different perspectives can provide input about an ideal patient journey based on personas or situations. Don’t forget the internal coordination. We’ve found that the best patient care and predictable reimbursement are achieved by synchronizing the revenue cycle with the workflows of clinical staff, utilization review, and hospital operation systems. Maximize clinical outcomes by setting standards of care. Reduce variations to eliminate friction and improve efficiency. Standardize processes and policies across different departments for consistency and one version of the truth. Finally, just try it. Even incremental improvements in the provider sector could have a big impact on patient success, higher reimbursements, and more streamlined care. When patients are in the center of a healthcare organization, any improvements to their condition and well-being are worth the challenge.